I am writing this page mid summer after clearing a section of the garden and these things are everywhere. I have noticed them on some of my softer stemmed bonsai like the new growth on the elms and azalea. These bugs are native to Australia but have become more prolific in the north island of New Zealand than they are in their country of origin. There are two distinct stages of the passion vine hopper and you could be forgiven for thinking they were two different pests. They survive as eggs over winter and hatch out as tiny nymphs with white fluffy like peacock like tails, from late January on they go through another molt and change into the small brown adults that look like small smooth winged moths that seem to queue in orderly fashion up the stems of your tree. When disturbed both nymph and adult have the ability to spring from the tree usually up your nose, in your ear or eyes or anywhere they deem annoying. The adults tend to hang around until May which is autumn in New Zealand. 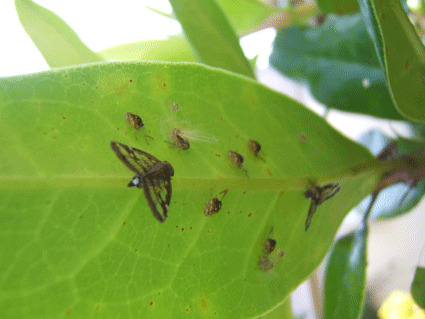 The adult passion vine hopper will mate and lay eggs through a sharp ovipositor into thin twigs of the host plant as the ovipositor is withdrawn small tufts of plant material are pulled out with it. This leaves small white tufts at regular intervals on the stem which can be seen with the naked eye. If the infestation is bad enough (which should never happen on a well cared for bonsai) the new growth may become distorted and stunted. The other problem with bad infestations is the amount of sticky honey dew these insects excrete. This in turn provides an environment for sooty mould to grow which is unsightly. The honey dew attracts ants and wasps to your plants which while not harmful can be unpleasant when you work on your tree. 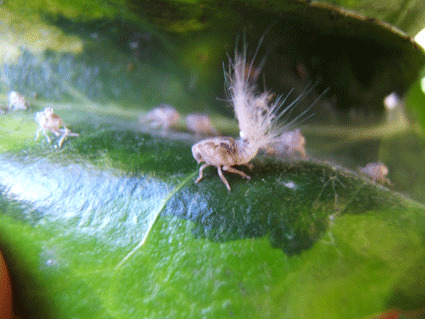 Control is best carried out when the bugs are at their juvenile stage in late November. They are then susceptible to most insecticide sprays. Later when they develop they again seem to seek shelter in your face hair or shirt, while you spray a now bug free plant. The best control is to remove host plants from near your bonsai or at the very least give plants that were infested previously a good prune over winter to remove the eggs then burn the clippings. With host plants removed or winter pruned the problems on your bonsai should be minimal.